We were at the recent Maker Faire in San Mateo demoing the project at the Intel booth. Lots of interest there, and we’re looking forward to continued collaborations with Intel. We’re in the process of porting the Galileo version over to the Intel Edison, and should have something available in the next few weeks. After that, we’ll move on to the Raspberry Pi 2. There are many new widgets, as we work to fill out NTK to be fully functional. See below for more details. In order to deal with all these widgets, we’re reworking how the widgets are displayed and added to the system. Our goal is that widget creators will simply add a folder containing their widget files to the system, and it will automatically appear in the toolbar within the category the creator sets. Users will be able to select a widget from a category by flipping open that section open and clicking. Of course, we’re working on bugs, performance and many other feature enhancements. Over the last couple months, we’ve added nine new widgets, with more to come. Here’s what’s available now in the Dev branch. Let us know if you have any suggestions for more widgets. Keyboard – Tracks what key is pressed, and outputs either the key code, or acts as a switch if set to listen for s specific key. This is especially useful when using things like the Makey Makey, or enabling the cursor keys to do something. Data – Allows the user to create a database of either text or numeric data that can be output in order or randomly. For example, a collection of words can be put into the widget, and then every time Data’s input goes above a threshold a new word is output. Text – Displays it’s input in a text box in the browser. Works well getting it’s input from the Data widget. Boolean – Takes up to four inputs and outputs a high or low value if the combination of inputs meets the criteria or not. User settable to require all inputs or any input to have a high value. Gate – The widget gates (turns on or off) the output of values from one or two gated inputs, depending on the main input value. Mix – Takes up to four inputs combines them in selectable ways into a single output (e.g. most recent, sum, multiply, average, min, max). Count – Increments the output every time it receives a high value from the input. Pulse – Sends out a value every time period. For example, Pulse can send a high value every one second (returns to a low value until the next time), or Pulse can send out a new random number from 0 to 1023 every 1 to 5 minutes. Process – Takes input values and inverts, smooths, or adds easing for the output. These are in development and should be pushed to the Dev branch in the next month or so. 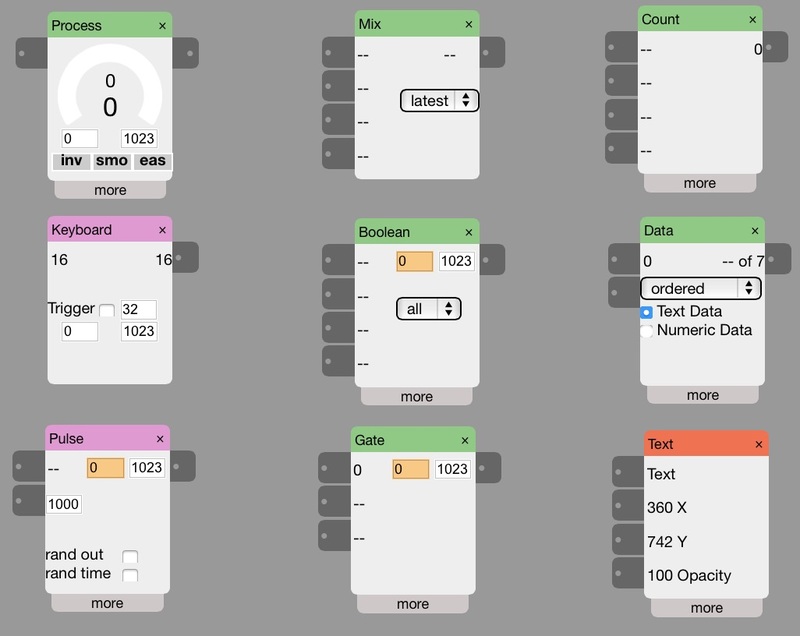 Animate – Output eased sequences of numbers to drive any output. E.g. animate servo or on-screen graphic movement with a specific sequence. WebScrape – Gather data from an external website. TextParse – Break text into paragraphs, sentences, or words. WebHook – Send a webhook to a server. For example, send a Tweet via Zapier.